Fifty members, including several ‘new’ beginners, began the walk at the beach car park in pleasant weather conditions. Singing and New Holland Honeyeaters were foraging in the trees and a lone Brown Quail was seen in dense undergrowth. A Black-shouldered Kite hovered over the heathland and an Australian Hobby flew swiftly overhead. Golden-headed Cisticolas and European Goldfinches were also seen there, perched on dead bushes. On returning to the cars, a convoy was formed to drive the short distance to Point Cook Homestead. On the way, we stopped beside the road at a constructed wetland which proved to be very productive. Birds sighted included an Australian Reed-Warbler on a nest and two Australian Spotted Crakes. Later in the afternoon, 10 members returned to this site and saw a Baillon’s Crake which shows how well waterbirds respond to the right environment when their normal ponds have dried up. Lunch was eaten at the Cheetham Wetlands car park where a Spotted Harrier was seen to land in an adjacent paddock. Getting a good look at Zebra Finches flying on and off the fences provided an interesting challenge for some of the beginners. The group then walked past the old Homestead to the shore where birds were plentiful. Highlights were several Common Terns perched on rocks at the Point and a Black-faced Cormorant resting on the Homestead jetty. Returning to the cars, a young Brown Falcon perched on a fence post created a lot of interest. 57 species were recorded for the day, including ‘firsts’ for many of the beginners and some great sightings for all. A cool south westerly chilled 11 post-Cup dedicated birders as they assembled. Hazel and Alan Veevers led our group and the first concern was to drive to the Cheetham wetlands coast to look for shorebirds as the tide rose. We paused to check the small ponds in a new housing estate where Pacific Black Duck, Chestnut Teal and Eurasian Coot had joined the adaptable Common Starling and Little Raven. The tide beat us and a challenging lone Red-capped Plover was the only shorebird but the birding was still eye-opening. Few of us had encountered Hoary-headed Grebe on the sea but here several were diving among the waves. The many Chestnut Teal and Black Swan in such a location were more familiar. Taking the long route back to the cars we encountered territorial squabbles between honeyeaters with a Singing Honeyeater prevailing over a New Holland for possession of the valued high perch on one of the few scattered bushes. Whiskered (Marsh) Terns were numerous along the coast and close inland but we saw only one Crested Tern. Raptors were initially scarce but a perched Australian Hobby ‘broke the drought’ and the final tally included a courting pair of Whistling Kite, a juvenile Black-shouldered Kite, a hunting Nankeen Kestrel and a Brown Falcon. The area is extremely dry with cracked clay and almost no standing water. In only one place were frogs calling though white butterflies were numerous enough to be a distraction as they flew. Golden-headed Cisticola and Eurasian Skylark were finally tracked down by their calls as we walked to the Migration Tower. This area yielded brief glimpses of White-fronted Chat and distant views of Australian Pied Oystercatcher. Near the homestead a determined Willie Wagtail harassed a Little Raven, making audible contact, until the raven departed. After lunch we checked the beach near the homestead where our first approach was made memorable by more than 100 teal flushing from the beach to separate into smaller groups on the water. 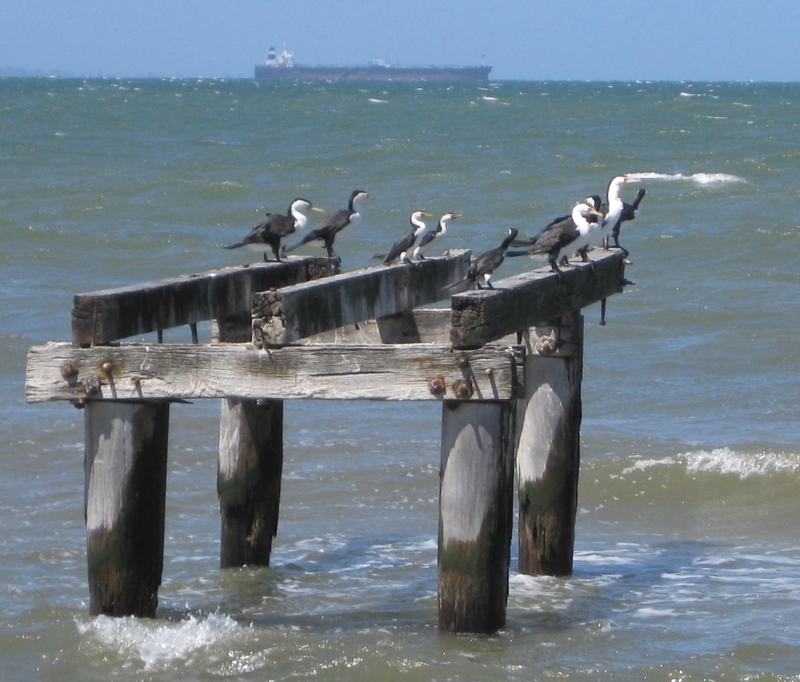 A short walk brought us to the remains of a jetty with Pied, Little Pied and Black-faced Cormorant roosting. A quick check of the beach picnic area added a couple more bush birds to the day, Grey Fantail and Silvereye, though this area had been recently burnt and slashed so it supported less than previously. Bird call resulted in a final tally of 50 species and broad smiles all round as we thanked Hazel and Alan for showing us the potential of the park. At the beach car park, 41 members assembled on a pleasantly cool morning, some already having seen a Little Eagle and a Whistling Kite over the heathland as they drove in. Taking the southernmost track, Willie Wagtails and European Goldfinch were plentiful but the hoped-for Brown Quail were elusive (a single bird was seen later). A gusty wind made our task difficult as we returned on the beachside track, seeing only a few species over the heath and the bay. The totally dry Spectacle Lake was bypassed on the way to lunch at Cheetham Wetlands car park, from which Swamp Harriers and a lone Brown Falcon were seen. 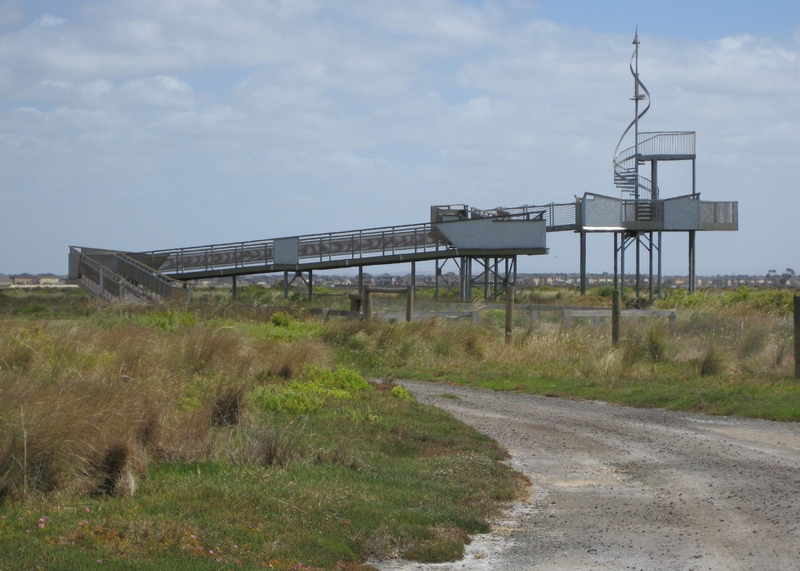 The afternoon walk was a circuit taking in Point Cook and returning past the Homestead. An Australasian Pipit stood obligingly for all to see before we reached the ‘hot spot’ at the Point. There, a sizeable flock of Red-necked Stints foraged on the beach whilst many Crested Terns and several Common Terns rested on the rocks with Pied and Little Pied Cormorants. A White-faced Heron waded amongst them. Highlights near the Homestead were a Sacred Kingfisher and a light-morph Brown Falcon, both of which remained perched for all to see. Despite missing out on a few target species, the group had enjoyed a lovely day birding in a great location.